Used as a dust, weather and water seal around the sunroof frame. 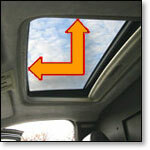 PVC Foam tape provides an airtight seal around the sunroof opening and retains its durability and compression recovery through repeated open and closing actions. PVC serves as a high performace weatherstripping tape against indoor and outdoor elements. Inherent fire retardency and UV (ultra-violet light) resistance makes it a superior seal. Our automotive sunroof sealing tape is self wound with an easy to peel liner that is cast onto the foam rather than the adhesive. Simply unwind to expose the adhesive side and apply gentle pressure to stick. Acrylic adhesive can take up to 72 hours to reach its maximum bond.